I finished this painting when I was 27 years old. This is a remake of the same composition I did a while ago, just painted differently. This is a social commentary piece which shows American society. Although most people around the world dream of coming to Hollywood Blvd the reality of it is not so great for some, like the homeless people living there. This piece shows a homeless man, passed out, from which ever reason that’s up to the viewer to decide. The women in the background passed by him like this is normal, without caring whether this man is dead or alive. Of course this isn’t just about those women, those women represent American society, or better yet, the middle class. This homeless man may have become homeless for different reasons, such as perhaps being a drug addict or an alcoholic, or even losing his job and his home to foreclosure, which is a reality in United States and could very well happen to the women who passed by him in the background. I usually notice some people blaming the homeless for them being homeless, and accusing them blindly that they are drug addicts and alcoholics without really knowing anything about them, and even if they do drink or do drugs how could you know what they are truly going through? They do it to get through the day of the short life that he has left and I don’t judge them for that. If your argument is that they can get a job, please tell me who would hire them even to clean toilets? I doubt anyone would actually hire them due to different reasons. The star on which this homeless man is laying on is of a 1920’s silent movie comedian Clyde Cook. 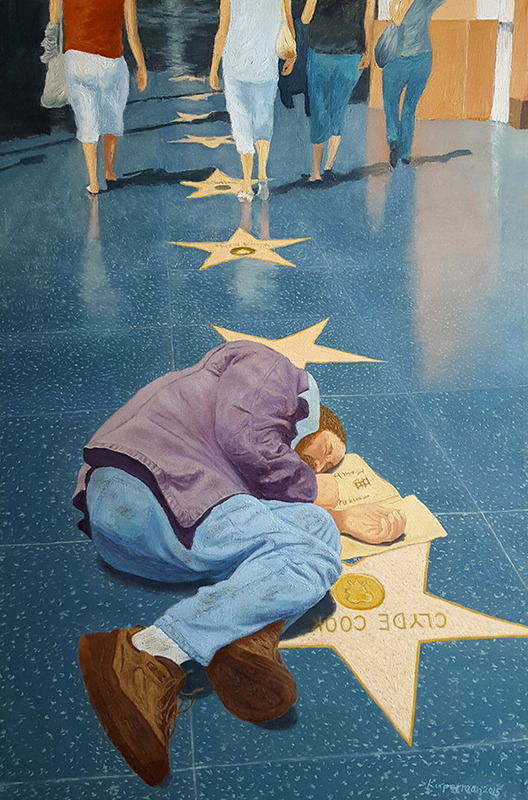 The reason why he is on the star is because this is a silent scene, and not many like to talk about homeless people living in the streets. It may also be comical to some sociopaths which live all around United States, who don’t care and don’t realize that this person laying there is also a human being just like they are. I hope you enjoyed this piece, and if this piece has touched you, you can go to http://www.endhomelessness.org/ to find out things that you can do to help this issue. I hope you enjoyed this work. Thank you for watching and reading!